With smartphones and tablets taking away an increasingly large share of web traffic, companies have to rethink their approach to web and adopt a "mobile first" mindset. However, in today's high paced, highly fragmented mobile environment, implementing a successful mobile web strategy is not a simple undertaking. Yet, failure to capitalize on the ubiquity and richness of the mobile web means loss of competitiveness. 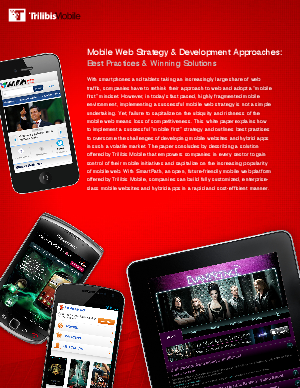 This white paper describes a future-friendly mobile strategy and outlines best practices to overcome the challenges of developing mobile websites and hybrid apps in such a volatile, rapidly evolving market. The paper concludes by describing a solution offered by Trilibis Mobile that empowers companies in every sector to gain control of their mobile initiatives and capitalize on the increasing popularity of mobile web. With SmartPath, Trilibis' open and flexible mobile web platform, companies can build fully customized, back-end integrated mobile websites and hybrid apps in a rapid and cost-efficient manner.